"The Anomalous Subsurface Environment is more than just robots and lasers – it's clowns and dinosaurs, too! 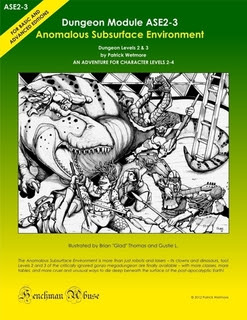 Levels 2 and 3 of the critically ignored gonzo megadungeon are finally available – with more classes, more tables, and more cruel and unusual ways to die deep beneath the surface of the post-apocalyptic Earth"
When it comes to mega dungeons that don't get the press they deserve ASE1: Anomalous Subsurface Environment By Patrick Wetmore is high on my list of adventures. The last time it got a bit of a nod was on my blog last year & I haven't gotten back to it a year or more. The gonzo nature of the adventure typically puts folks off. But the fact is that the second adventure is the equivalent of a science fantasy gold rush across a fantasy world. This is one of the reasons why ASE2-3 is a necessary step for a DM planning on introducing the city of Denethix to their campaign world. For me the world of ASE is a science fantasy/fantasy world in the vein of DC's late Seventies settings that they used along side of their regular world. 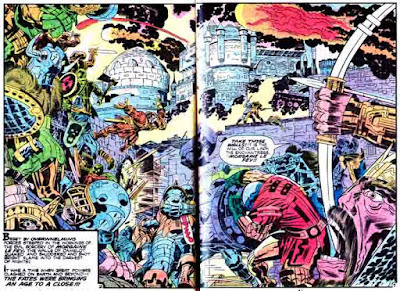 A high end Jack Kirby Style Forth World science fantasy event happened & the old world ended in a spectacular fashion. This two page spread from Jack Kirby's Demon comic book run really brings home the feel of the world of ASE to me. Since then the world has climbed its way to a black powder style wheel lock & flint lock level of technology. There are scattered pockets of barbarianism & tribal warfare happening all over the place. Before he threw his toys out of the pram, the Dungeon of Signs blog had a great free adventure resource called the LAND OF 1,000 TOWERS (ASE) ADVENTURE which is the perfect way to introduce a party to the whole ASE1 setting. 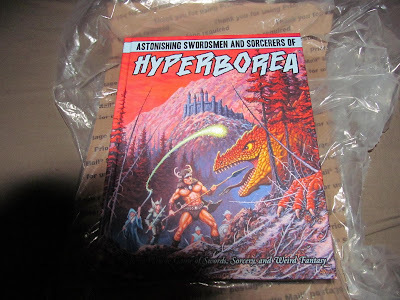 This brings me to Astonishing Swords men & Sorcerers of Hyperbroea second edition's game setting which could be another other dimensional piece of the ASE campaign cosmology. ASE2-3 really has several ideas within it that remind me of Clark Ashton Smith's Zothique setting in principle & setting dynamics. The world has passed on but bits & pieces of the 'Old Earth ' remains. Sure its played for laughs in ASE but there's lots of potential for a massive cross game megadungeon event. The appearance of the mega dungeon ASE might be the apocalyptic sign for other mega dungeons to burst across OSR game lands! Could the cults of Orcus use this chaos to ramp up the power of chaos across the multiverse? Imagine that the appearance of one mega dungeon signals the appearance of a multitude of other old school dungeons to 'awaken' after thousands of years! Another gold rush ensues & economic chaos grips the world as weird artifacts & horror sweep in! Yeah, I'm talking combining ASE2-3 with the Adventurer,Conqueror, King version of Dwimmermount! Think about this as an "Eighties Marvel style comic book Summer spectacular" but its an OSR sandbox style mega dungeon romp! The echoes of the opening of doors of the mega dungeon to resound across the dimensions & suddenly ancient evil stirs across the lands! Could this also be an apocalyptic sign to a vile villain stirring in the ancient prehistoric swamps of Blackmoor? Has this been the excuse its been waiting for? 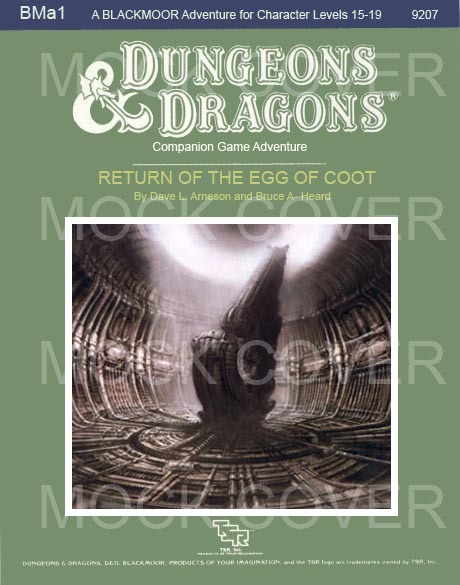 Could the Lovecraftian Egg of Coot have been waiting for just such an event to bring itself back onto the cosmic stage?! 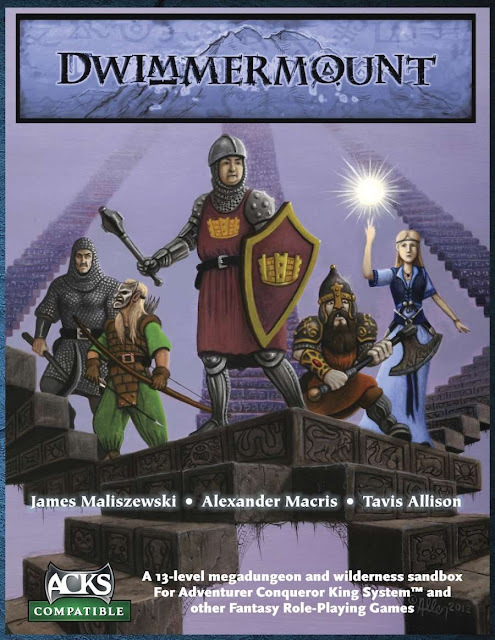 Mega dungeon locations are nothing to meddle with & Dave Hargrave had his fair share of Arduin adventure locations that would fit right into the Apocalyptic themes of such a Summer campaign cycle. 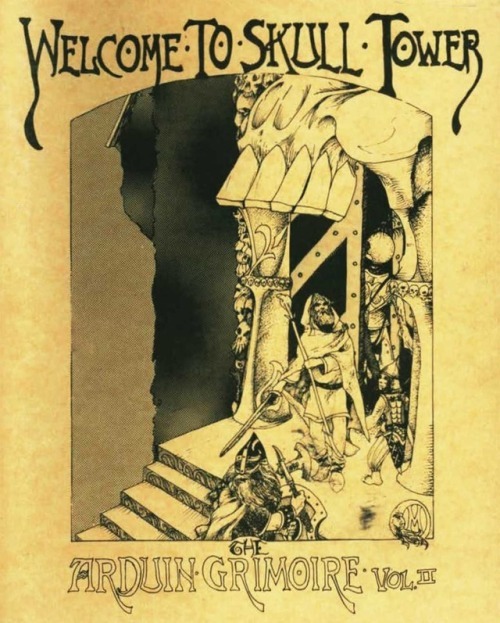 The Arduin Grimoire II: Welcome to Skull Tower by Dave Hargrave from Grimoire Games published in 1978 slots right into the back end of this with an adventure location to be devil the Hell out of players. Gary Gygax has several modules that I think would weave right into this style of a mega campaign cycle. Those are going to wait till tomorrow!